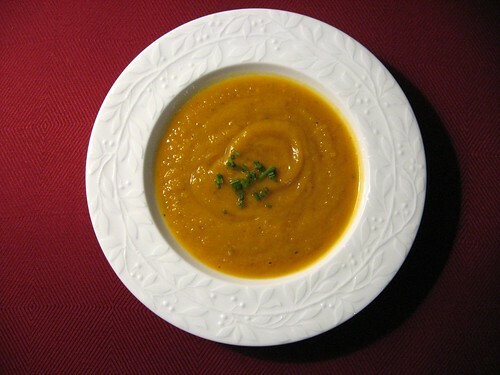 A friend recently sent me a recipe for roasted butternut squash and shallot soup she found from Cooking Light. I love butternut squash soup, but I love it the way you should never have it – with heavy cream and sherry. Cooking Light outlines a healthier way to enjoy this soup, but unfortunately the recipe was a little expensive and called for ingredients that I don’t usually keep on hand, such as shallots, fresh ginger root and fresh chives. Ginger root is not expensive but I don’t love an overpowering ginger taste, shallots may be a little sweeter than regular onions but they’re also more expensive, and fresh chives are also expensive, especially if they’re only acting as a garnish. I tried to minimize the cost of this recipe and make it a little more manageable for the average pantry. I found the onion taste to be a tad strong, but my husband had no complaints. Yet you do have to like onions to enjoy this recipe. There are other milder versions of this soup, as well as versions that incorporate nuts and apples. These sound absolutely delicious, and I’m excited to try them, but for this particular recipe I was trying to keep it simple. I served this as the main course for dinner for my husband and I, so we had two full bowls with a little bit leftover. This would also be great as a side to have with a grilled cheese sandwich; I had a piece of bread with my soup and I enjoyed dipping the bread into the soup. If you have other vegetables in your kitchen that you would like to use, such as carrots, that would make an excellent addition as well. Preheat oven to 375°. Combine butternut squash cubes, oil, salt, minced ginger, minced garlic, chopped onion and minced ginger in a jelly-roll pan. Bake for 50 minutes or until tender, stirring occasionally. Cool 10 minutes. Pour half the squash mixture and half the broth into a blender. Remove the center piece of the blender’s lid to allow heat to escape; lay a folded paper towel over the opening. Blend mixture until smooth, then pour into a large saucepan. Pour the remaining squash mixture and broth into the blender and repeat previous process. Cook over medium heat for five minutes or until thoroughly heated. Top with scallions and pepper as desired. Don’t buy stock ever again. That’s right, I said it. There’s just no reason to, really. First off, there’s quality. Homemade stock is just so much better tasting and better for you (not processed). Second, it’s easy to make and we’ll show you the basics today. If you don’t have stock but are in desperate need, consider water. Water is awesome and chances are it’ll do more for your food than canned stock. I wish I could take credit for this but I can’t. Michael Ruhlman, the cooking heavyweight showed me the light and today I am going to spread the word. Read his article, join the empowered, then come back and take your next steps. As Michael says, Thanksgiving is THE best time to make stock. You’ve got an entire turkey to use and many think turkey stock tastes better than chicken stock; both are quite healthy. 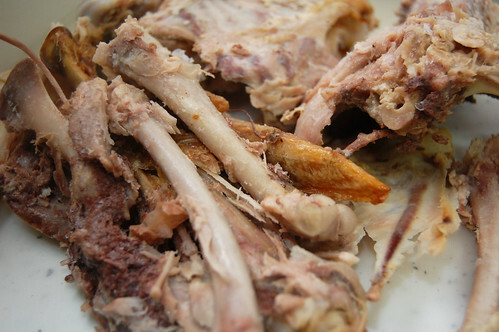 Once you’ve stripped your carcass of all it’s tasty meat, don’t throw it away! Keep it, love it, nurture it; into an excellent broth for use all winter. Cooking stock requires a long slow cook to pull the flavor from the bones, but if you use the recipe below you can cut back significantly on the effort required using a crock pot. Everyone loves convenience. This recipe is very flexible with portions with regard to the vegetables. Consider saving the end pieces that you normally throw away in regular cooking for this. 1 turkey carcass; stripped of its meat. Add one tablespoon of olive oil to a large pot and sauté the onion in medium heat until softened and slightly transparent, 2 to 3 minutes, then transfer to your slow cooker. Add another tablespoon of olive oil and sauté the turkey bones for 4-5 minutes. Transfer the turkey, carrots, celery, thyme, parsley and peppercorns to your slow cooker. Cover with water and cook for 8-10 hours. Let cool slightly then strain into a large bowl. Let sit for 5-10 minutes and skim off any fat that rises to the surface. If you really want to make sure you get as much fat as possible place your stock, covered, in the fridge overnight. More of the fat will rise and harden, making it easy to remove. To store, I recommend pouring into ice cube trays and freezing. This is a convenient way to use a bit at a time. 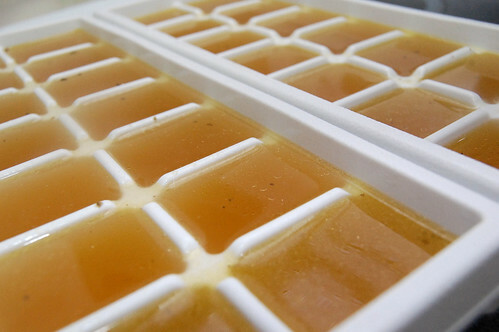 Stock in the freezer will last for at least six months. Two of my good friends recently purchased and moved in to their first home. They invited my husband and I over on Sunday to watch the Steelers vs. Cowboys game and get our first glimpse of their new home. It was very exciting, and also time to crank up the oven for an edible housewarming/game day treat. I keep the recipes I’m looking forward to making in an archived folder online, I have a binder where I print recipes and tear others out of magazines to hold for later, and of course, I have lots of cookbooks. But sometimes you just want to be a little impulsive with what you make! 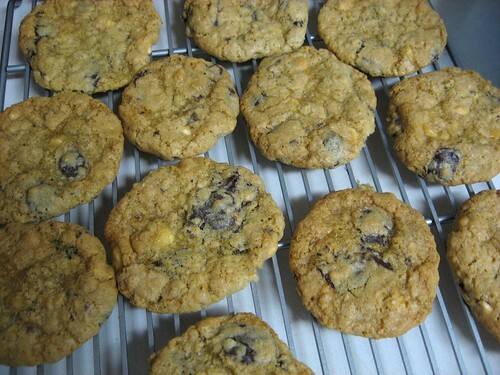 I usually lean towards soft, chewy cookies, and the recipe said these would be soft and chewy, but I thought they actually came out on the crispy side (I know many people prefer crispy cookies, so I didn’t stress). I combined semi-sweet, bittersweet, and white chocolate in the cookies, but I think they would be better with bigger chunks of just one type of chocolate. I also added chopped walnuts to half the batch. Everyone should have a reliable cookie recipe; I don’t think this one will be mine, though they were pretty good. What is your go-to cookie recipe? Combine softened butter and both sugars in a large bowl. Beat until creamy. Beat in egg and vanilla extract; set aside. Sift the flour, salt, baking powder and baking soda into a small bowl. Gradually add this mixture to the butter mixture and beat continuously. Carefully fold in oats and chocolate chunks. Spoon tablespoonfuls of dough, two inches apart, onto the baking sheets (these cookies will spread). Bake until lightly browned, about 10 minutes. Cool on pan for 2 minutes before transferring to a wire rack. This makes about 2 dozen cookies. Winter is officially here in DC, and by officially I mean it has been decided by me. It didn’t feel like we had much of an autumn this year, which is a shame. Autumn is a beautiful time of the year, with the mild cold adding a crispness to the air without being harsh enough to shuffle you indoors and into a quasi-hibernation state (I’m talking about you winter). Alas, all good things must come to an end. For me, winter lends itself to old-fashioned meals; comfort foods. Slow, languid cooking just seems right. The crock pot and dutch oven become the stars this season, using their special skills to transform the bitter winter vegetables into a sweet and savory meal. Yes, it is the season of soups and stews; some of my favorite food. While volunteering for chef Christine Illich at L’Academie de Cuisine a few months ago I picked up a delicious minestrone recipe, perfect for the winter. 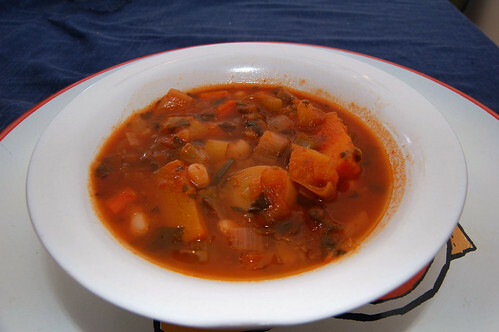 This soup freezes well and like all good soups is flexible with regard to the ingredients used. Feel free the experiment. You’re sure to come up with delicious results. If you enjoy the fennel flavoring, consider chopping some of the fronds leftover and adding it in addition to the rosemary. Boil the pasta as per the package’s instructions. Sweat the onion, carrots and celery for ten minutes. Add the leeks and fennel for another 10. Add the water, squash, spinach, sweet potato, beans, salt and rosemary and bring to a boil. Simmer for 30-45 minutes, until all the vegetables are soft. Add additional salt to taste. To service, place a spoonful or more of pasta into a bowl and pour the soup over. Grate parmesan on top. If spaghetti squash is the oddest vegetable I’ve ever worked with, then celery root is by far the ugliest. Harsh, I know, but look at it. Knobby, rough texture, no vibrant colors. But like Mom always said, it’s what’s underneath that counts; and underneath is a cream colored flesh with a slight nutty flavor. 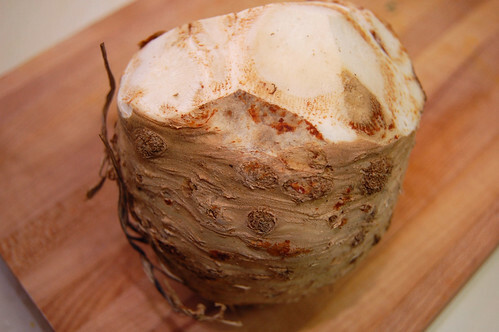 I’ve never done anything with celery root before but have had this quiet desire to coax a soup out of one some day. When I saw some on sale at the local Whole Foods I felt it was time. 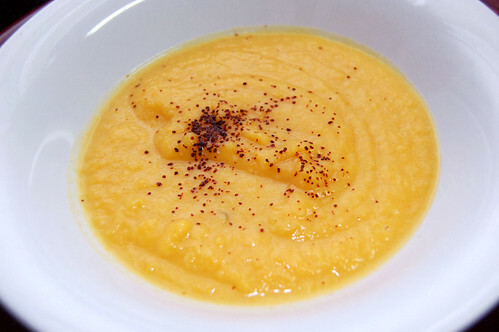 This is a very winter soup with the addition of butternut squash and sweet potatoes. The celery root is faint, but present. The best way to remove the rough outer skin is simply with a quick pass or two through with a vegetable peeler. From there you can remove any deeper blemishes with a paring knife. For some reason this really dried my hands out and I haven’t figured out why. Keep that in mind while your handling it. An easy way to clean leeks is to soak then in water while chopping the other vegetables. When ready to use, just scoop them out. Sweat the leeks, garlic and onion with some oil in a large heavy bottomed pot or dutch oven for 10 minutes. 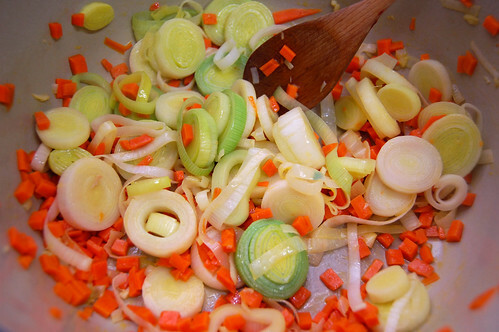 Once the onions are translucent, add the remaining vegetables with the water and bring to a boil. Simmer for approximately 30 minutes until vegetables are soft. Remove from heat and let cool. Either blend in batches with a standard blender or all at once with an immersion blender, adding cream until you get a nice creamy texture. Add the salt to taste. Optionally, a bit of ancho chili pepper for a kick. 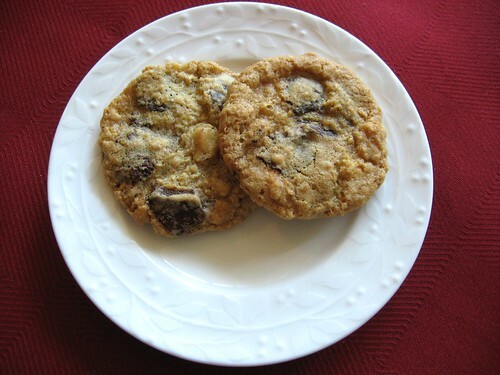 At the Arlington Farmers’ Market in Northern Virginia on Saturdays you can find a woman that makes the most amazing cookies. She simply goes by “The Cookie Lady” at her stand, and she pulls you in by offering free samples of any of her cookies. They’re twice the size of a regular cookie, thick, dense and they taste like cookies on steroids. 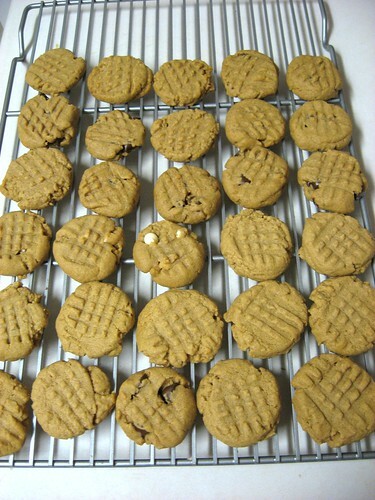 Imagine enjoying a delicious peanut butter cookie – now imagine eating a jar of peanut butter. There is not a lot of subtlety to her flavors, they’re just completely packed and insanely delicious. 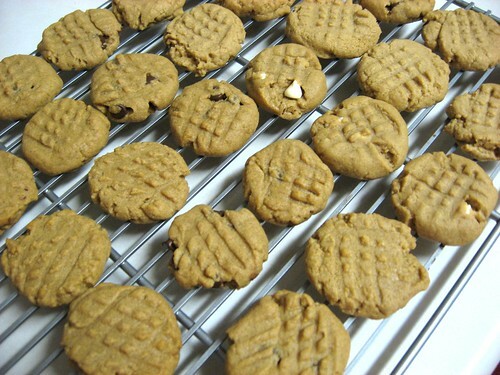 To attempt to recreate these cookies but in a smaller, more manageable form, I was thinking about The Cookie Lady’s peanut butter cookies and also looking at some recipes from Cookie Madness and Smitten Kitchen. Instead of using peanut butter chips, I doubled the amount of smooth peanut butter. I also added 1/2 tablespoon of milk. Half the batch I kept as pure, unadulterated peanut butter cookies, and the other half I experimented by adding semi-sweet chocolate chips, bittersweet chips, or white chocolate chips. I think these came out really well. They’re still not quite at the level of The Cookie Lady, but they are packed with peanut butter. I liked the plain peanut butter cookies without chips the best, but if you’d like to add something to the batter the white chocolate chips were also a nice touch. Preheat oven to 350 degrees. Line two ungreased cookie sheets with parchment paper. 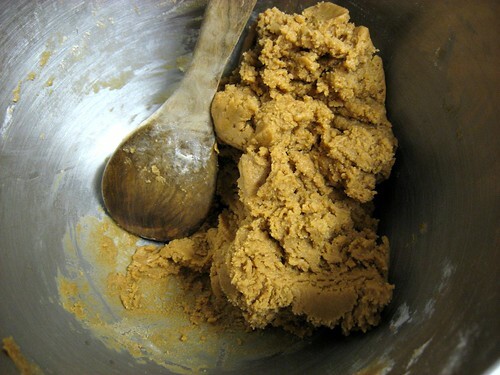 Combine softened butter, dark brown sugar and granulated sugar. Beat in the peanut butter and egg. Beat in the salt, baking soda, vanilla and milk until fully incorporated. Add sifted flour last and stir until blended. 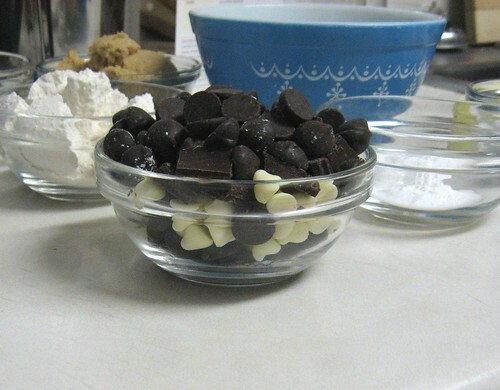 If you wish to add white chocolate chips, you can add them now. Place dough on cookie sheets by 1/2 tablespoon. Gently flatten the dough balls using a fork, making a light criss cross pattern. Bake for approximately 10 minutes until done. Cool on pan for about 5 minutes, then transfer to a wire rack to cool completely. You may also like to decorate the top with some extra sugar. This has got to be the craziest vegetable I’ve ever worked with. My friend Lindsay and I were rock climbing and somehow the conversation transitioned to food. Why, I have no idea. I feel a study should be conducted on how often I talk about food in comparison to how often I talk about… anything else. 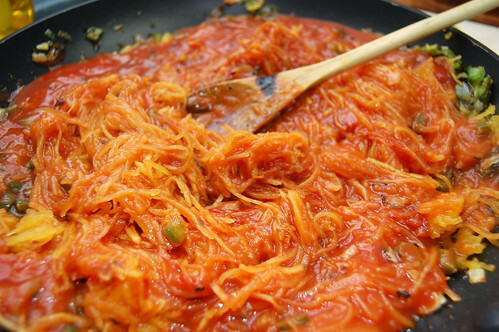 Anyway, Lindsay told me of this magical vegetable called spaghetti squash, aptly named because its flesh falls away in strands similar to spaghetti. This blew my mind. “So you can make spaghetti with squash? Madness!” So of course being the vegetable freak I am I had to try it. 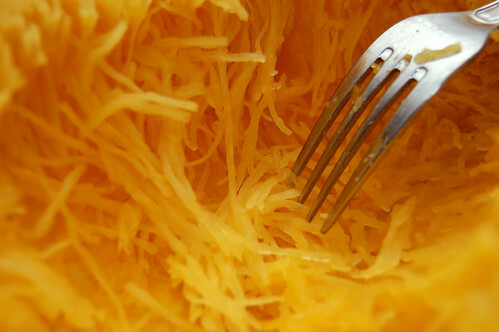 Like just about every vegetable, spaghetti squash has high nutritious value, being a good source for folic acid, potassium, vitamin A and beta carotene (thank you Wikipedia). It’s also a low calorie food making it a great option for post Thanksgiving meals. I recommend going with the smaller sizes which are much easier to work with (I’m sporting a nice burn on my left hand right now) and more flavorful. To be fair, spaghetti squash will never truly compete with pasta for the same dishes. You can’t get a true al dente texture with spaghetti squash, but instead a crunch. Still, it’s a nice variation that I will be revisiting again. This is something that might go great with a flavorful butter sage sauce or a garlic pesto. 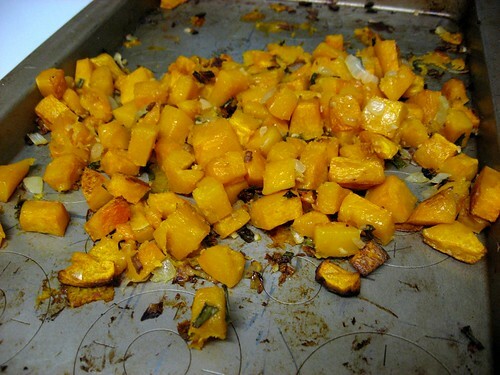 While bringing a large part of water to a boil, piece the squash in several places. This will help the insides cook. Add the squash carefully to the pot, preferably with tongs and boil for approximately 25 minutes until the skin is tender. If the pot isn’t large enough to cover the squash in water, then occasionally rotate with your tongs 3-4 times during the cooking process. 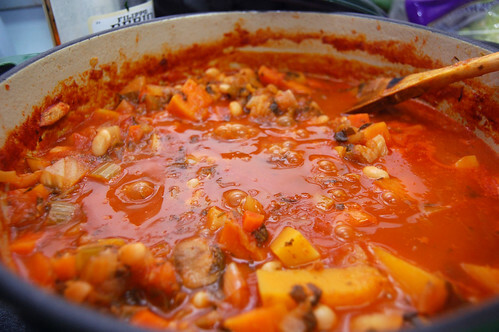 While the squash is cooking, prepare your spaghetti sauce or heat your premade sauce in a medium sized pot. Once the squash is ready, strain in a colander and let sit to cool down and continue to drain. After a few minutes, transfer to a cutting board and cut in half. Scoop out the seeds and fibrous center. Then, pull the fork lengthwise through the flesh of the squash to separate it into strands. Either throw in with your tomato sauce or serve into a bowl and add the sauce separately. As promised, I’m posting an actual dinner recipe for the first time in five posts! It’s a miracle, my sweet tooth is sated (don’t worry, not for long). Salmon won out as the healthiest, lightest thing I could think of to compensate for my total failure in watching what I eat in the last few weeks. 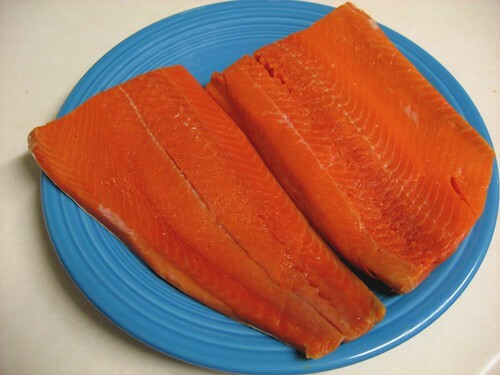 Wild salmon is high in protein, Omega-3 fatty acids and vitamin D. WebMD lists salmon as one of the top “super foods,” lowering your cholesterol, reducing your risk of cancer and heart disease and even brightening your mood (and yes, pumpkin is on that list, too). I looked for a salmon recipe that had the spirit of the season, and I think I found what I wanted. The glaze was almost sweet, combining honey and apple cider as a marinade. Maybe it was just enough to satisfy my sweet tooth while still providing all the benefits of a healthy fish fillet. Also note when buying your salmon that you want wild instead of farmed. Below I altered the recommended amount of white wine for the spinach leaves. Maybe I got carried away somehow, but the wine taste was a little too strong and I didn’t think it mixed well with the honey and cider taste of the salmon. I also served mine with a side of asparagus in addition to spinach leaves, since cooking the leaves really decimated them. And good luck in your own battle of the Thanksgiving bulge, let me know if you have more healthy recipes or tips to stay away from the baked goods! Preheat oven to 350°F with a baking dish in the oven. 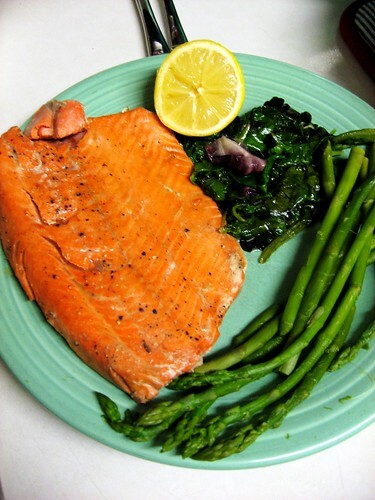 Set salmon fillets flat in a large baking dish. In a saucepan on medium-high heat, boil cider and honey for 1 to 2 minutes. Pour cider mixture over the salmon, let it sit for 10 minutes. Heat olive oil in a large skillet on medium-high. Sprinkle one side of the salmon with salt and pepper. Place the fish in the pan for approximately 2 minutes. Brush periodically with cider glaze. Turn the salmon and brush with remaining cider glaze. 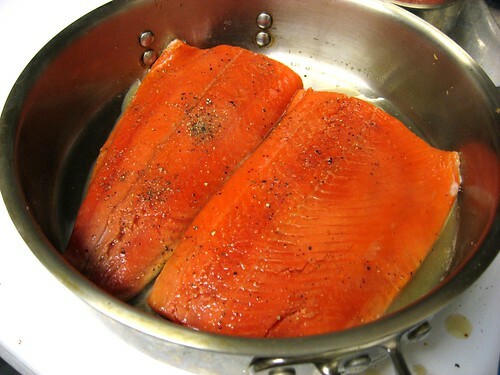 Remove from heat and transfer the salmon to the baking dish in the oven. 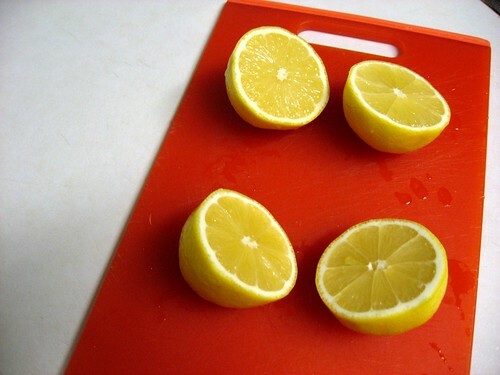 Add the two sliced lemons to the dish. Bake for 6 minutes, salmon is cooked when it flakes when tested with the tip of a knife. While the salmon, wash your skillet and place back on the stove to melt the butter (on medium-high heat). Add the spinach, salt, pepper and garlic. Cook just until leaves begin to wilt (a little less than one minute). Pour the wine sparingly over spinach and cook for an additional minute. Drain excess liquid from spinach in a drainer. So if you’re like most people, then your fridge is probably packed with food right now – if you’re lucky you can still open the door without something falling out. What do you do with all this food? In some cases you’re stuck with what you’ve got (mashed potatoes are probably going to stay mashed potatoes; feel free to correct me on this), yet with some things you get a lot more leeway. Take ham, for example. Ham is a popular item for the Thanksgiving feast, at least in my household. 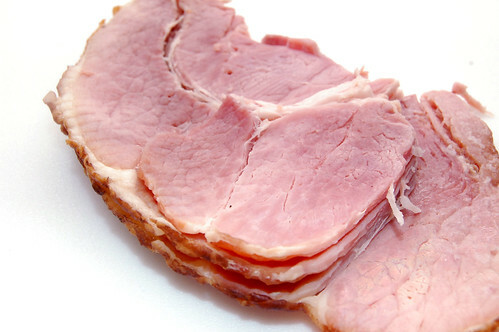 Undoubtedly we have ham leftover every year (when you make a turkey AND a ham, how could you not?) and undoubtedly we must come up with something to do with said leftover ham. One of the reasons Mom cooks so much is that she enjoys spreading the love, making trips to friends and dispensing it in tasty culinary form. Yet despite her best attempts there is always more food to deal with. This is a very simple recipe that my sister and I loved when we were growing up, and I’m sure my parents did as well simply because it’s so darn easy to prepare. 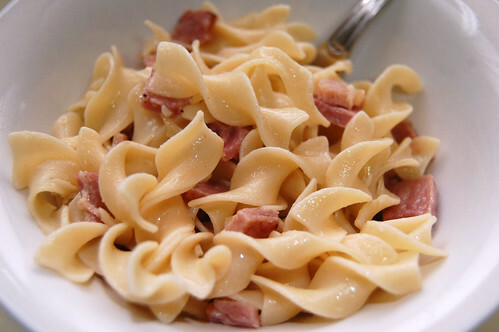 Leftover ham, noodles, butter – BAM, dinner. It doesn’t get much easier than this. This recipe feeds 2-3 people. Given that you’re already using leftover ham, I wouldn’t recommend making any more than this at one time. It’s so simple; just prepare it as you need it. Boil the egg noodles as per the instructions. While the noodles are boiling, cut your ham, trimming away any excess fat. Nuke in the microwave for 30-45 seconds till hot or fry it up in a pan with a little bit of butter. Put in a medium sized bowl. If including corn, strain and microwave for 1 minute. Once the noodles are ready, strain and add to the bowl of ham. Add one tablespoon of butter, mix until melted and taste. If you want it more Paula Deen style, add a second tablespoon and mix again until melted. And your corn, mix and serve immediately.